The Open/Close Sensor senses if a door or window is open or closed. The sensor consists of two small packages. One is a battery powered INSTEON radio and contains a magnetic switch. The other is a magnet. By mounting the radio on one surface and the magnet on another, the radio can tell if the two surfaces (a door and a doorway or two parts of a window) are next to each other (closed) or apart (open). Being battery powered devices, Open/Close Sensors spend most of their time "sleeping". They sleep to conserve their batteries. When a device is sleeping, it will respond to open/close events, but it won't listen to any events on the network. Battery powered devices will occasionally "wake up", so they can give the network an update of their internal state (battery state, as an example) and to receive any messages from the network. The time between wake ups for the open/close sensor is about 24 hours. The Open/Close Sensor has a set of electrical terminals available. The terminals allow hooking up external on/off type wired sensors. If you have a door or window sensor with wiring terminals, you can wire it to your Open/Close Sensor. 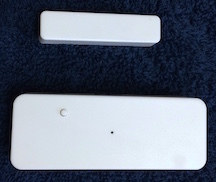 The Sensor will monitor both its door/window as well as your wired sensor(s). See your Open/Close Sensor's documentation for more information about wiring. The Open/close Sensor Device has two output status terminals. The "1S" terminal shows if a door/window is open (on), or closed (off). The "heartbeat" terminal shows that the battery is OK. Every 24 hours, if the battery is OK, the Open/Close Sensor Device will update the heartbeat terminal with the current state of the open/close sensor.